As noted in Chap. 3, molecular data congruently support a clade including the paraphyletic "Caprimulgiformes" and the Apodiformes, which share a greatly elongated leg (crus longum) of the ulnar carpal bone. Morphological characters further support a clade including the Caprimulgidae, Nyctibiidae, Aegothelidae, and Apodiformes, for which the name Cypselomorphae has been introduced (Fig. 12.1; Mayr 2002b). 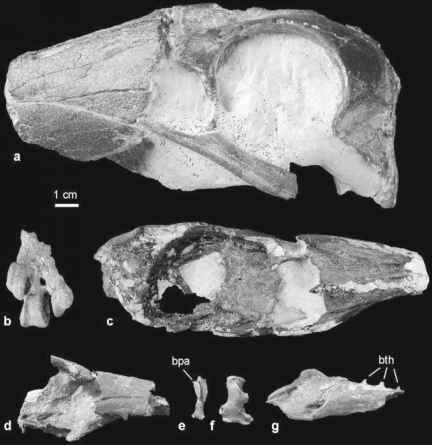 Among others (Mayr 2002b), the palatine bones of cypselomorph birds bear well-developed rostral processes (Fig. 12.2). The Steatornithidae exhibit a number of plesiomorphic features, which indicate a sister group relationship to a clade including the other "caprimulgiform" and apodiform taxa (Figs. 12.1, 12.2). The Aegothelidae are the sister taxon of the Apodiformes (Mayr 2002b; Mayr et al. 2003; Cracraft et al. 2004; Ericson et al. 2006). The taxa of the "Caprimulgiformes" are crepuscular or nocturnal birds. On the basis of the phylogeny in Fig. 12.1, it is most parsimonious to assume that there was a single origin of dark-activity in the stem lineage of the "Caprimulgiformes"/ Apodiformes clade, and a reversal to a diurnal way of living in the stem lineage of the Apodiformes (Mayr 2002b). A less parsimonious but possibly more plausible alternative explanation is a fourfold origin of dark-activity in the stem lineages of the Steatornithidae, Caprimulgidae/Nyctibiidae, Podargidae, and Aegothelidae. The origin of dark-activity in these aerial insectivores may well have been correlated with the evolution of nocturnal insects in the early Paleogene, such as the lepidopteran Noctuoidea ("owl"-moths), whose earliest unambiguous fossil records stem from that period (Kristensen and Skalski 1999). Despite the small size of its representatives, the "Caprimulgiformes"/Apodiformes clade has a fairly extensive Northern Hemisphere Paleogene fossil record, which includes stem group representatives of most extant groups.